Wow was it hot out there. Only six of us showed up to paint in the heat by the creek in Hidden Valley. When I set up I was surrounded by trees with a good canopy but what I didn't realize until the clouds parted was that I was directly under an opening in the trees. When the sun came out I started to cook and my oil paint became very soft and slippery. This is 16" X 12" and I painted it in about an hour and a half. That is very quick even for me but by the time I finished I was soaked in sweat and exhausted. The sun kept coming and going as the clouds swept by so I at times had to pause and wait to see where the light was hitting. Despite the discomfort and challenges it was great to be out painting. This was painted with transparent red iron oxide, phthalo blue, Hansa yellow and both zinc and titanium white. The limited palette makes it much easier to work fast. 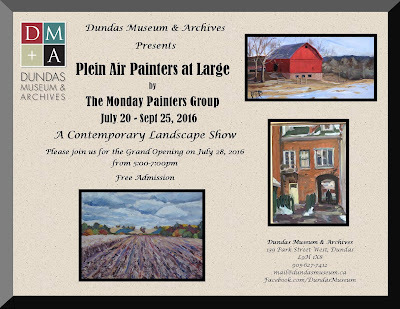 I paint with an amazing group of "plein air" artists. We meet Monday afternoons all year to paint at various outdoor locations around the western tip of Lake Ontario. 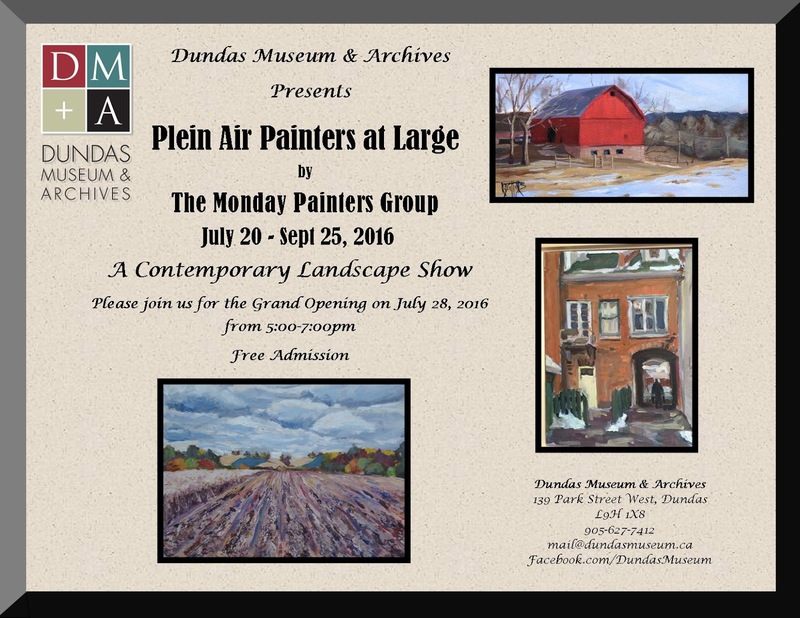 The third annual show is now hanging at the Dundas Museum and Archives. This show has works by seventeen of the Monday Painters and all pieces were painted outside on location. I am honoured to be a part of this group and am awestruck by the quality of the work on display. Our opening reception is Thursday July 28 from 5:00 - 7:00 pm, Everyone is welcome. 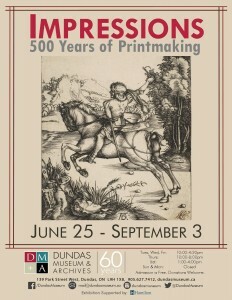 Hanging concurrently with our show, in the museum, is an awesome show titled "Impressions: 500 Years of Printmaking. The museum has gathered together an impressive collection of prints by many very well known masters. It starts with 500 year old woodcuts and ends with contemporary local artists. It is a must see for anyone interested in the development of printmaking. Admission to both shows is free however the museum does appreciate donations.